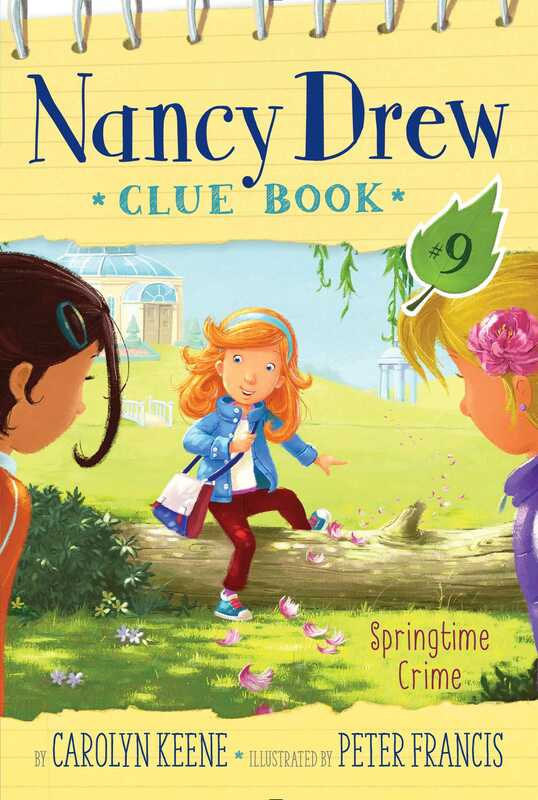 Help Nancy and her friends find out what happened to a superstar’s flower hat in the ninth book in the interactive Nancy Drew Clue Book mystery series. Spring has sprung in River Heights! The annual Flower Sculpture contest is in a couple of days and everyone in town is working hard to finish their floral works of art. But Nancy, Bess, and George are most excited to see the world-famous pop singer, Miss LaLa, perform. The superstar grew up in River Heights and has agreed to kick off the contest with a song. And just when the girls thought life couldn’t get any better, they run into Miss LaLa herself! The singer is in a bit of a pickle though: She brought a giant hat made of white peonies for the show but she doesn’t have a refrigerator big enough to store it in. George thinks quickly and offers to put it in her mom’s catering refrigerator. But when the girls check on the hat the next morning they see something has gone terribly wrong. Half of the snowy white blooms are wilted and brown! They use their detective skills to rule out a blackout. And George can’t remember if she locked the door last night. Could someone have snuck into the kitchen and switched the fresh flowers with droopy ones? Nancy and her friends are determined to find out! Could it be Madame Withers, whose signature wilted rose perfume was rejected by Miss LaLa? Perhaps it was the famous flower artist Pierre, who was angry that Miss LaLa was the star of the show. Or it maybe it was Benjamin Bing, who ruined his flower sculpture with brown hair spray and had no more white peonies to replace them. It’s up to the Clue Crew—and you—to find out! “Today spring finally feels like spring!” eight-year-old Nancy Drew declared. It was Friday afternoon and the first mild day of the year. After months of woolly hats, warm scarves, and puffy parkas, Nancy and her two best friends were wearing spring jackets in ice-cream colors. Nancy took a whiff of the awesome-smelling statues and sculptures made from fresh flowers. The temperature-controlled greenhouse they stood inside was the perfect place for the first annual River Heights Flower Sculpture Show. “Because bees like them too!” George complained. Nancy, Bess, and George strolled through the greenhouse. The flower show was on Sunday but people were welcome to watch the sculptors put the finishing touches on their sculptures. “I like that one best!” Bess said, pointing to a peony sculpture of a high-heeled shoe. Bess and George traded smiles. Not only did the two cousins look different—Bess had blond hair and blue eyes, while George had dark hair and dark eyes—they liked different things too. Bess loved girly-girl clothes and accessories. George loved accessories too—as long as they went with her computer and electronic gadgets. “My clue book!” Nancy replied right away. Bess and George nodded their approval. The three friends were the Clue Crew, the best kid detectives in River Heights. To help solve their mysteries, Nancy used a clue book to write down their thoughts, clues, and suspects. Nancy giggled. Miss LaLa was known for her beautiful violet eyes—and her wild costumes! “Or in that flower cupcake,” Bess declared. Nancy looked to see where Bess was pointing. She smiled when she saw a giant white cupcake made of peonies. Standing on a ladder while sticking a pink peony onto the top was a kid the girls recognized at once. “Hey, it’s Benjamin Bing,” Nancy said. Ben’s parents owned a health food and flower store on Main Street called Bing’s Buds and Bran. Nancy was embarrassed that Ben had heard them talking about him. “We were also saying how awesome your flower cupcake is, Ben,” she said quickly. Nancy tried to change the subject. “How will you keep your flowers fresh until Sunday, Ben?” she blurted. “Hair spray,” Ben said matter-of-factly. Nancy, Bess, and George stared open-mouthed at Ben’s sculpture as he kept spraying and talking. Something . . . was not . . . right. . . .
“Um . . . Ben?” Nancy interrupted. “Why?” Ben asked, still spraying away. “Since when is clear hair spray brown?” Bess asked. “Huh?” Ben said. He turned to look at his sculpture and gasped. A whole side of his snowy-white cupcake was now brown! The girls left Ben pacing nervously by his sculpture. Nancy felt bad for him and wanted to help. But how? “Maybe he could spray-paint them white,” George suggested. “I don’t think that would look very good. What about . . .” Bess trailed off midthought. “I may have an idea!” Nancy squeaked. The three of them had stopped in front of a giant poodle sculpture made of snow-white peonies. In River Heights there was only one sculptor famous for his peony poodles. He was from France and his name was Monsieur Pierre. But where was Monsieur Pierre? Nancy was about to ask another sculptor, when they heard voices. Angry voices coming from behind the peony poodle. The girls peeked around the sculpture to see Monsieur Pierre arguing with Mayor Strong. Nancy had heard the names Céline and Celeste before. They were Pierre’s standard poodles and the models for his sculptures. But as the girls turned to leave . . .
Nancy’s eyes widened at the sight of the woman standing behind them. She wore a black trench coat with huge padded shoulders, dark cat-eye sunglasses, and fire-engine-red lipstick. Her blond hair was tied in a low bun, and she was holding a large brown paper shopping bag. “Um . . . do we know you?” Nancy asked. “I think you do,” the woman said. She lowered her sunglasses to reveal the deepest violet-blue eyes.